How retail’s focus on brand authenticity, heritage and education are transforming workplace design. Think of the last store that wowed you. The things you loved about it, whether you realize it or not, stem from deep brand authenticity, engaging spaces and a seamless education on the space and its products. 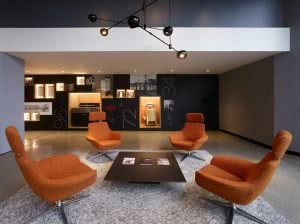 In our workplace practice, CallisonRTKL’s roots in retail have inspired our workplace design and have put us in a unique position to apply these ideas to our office projects. Even on a practical level, retail and workplace design are beginning to merge. Things like, tracking customers through stores to create optimal layouts and merchandising are coming to workplace design, where our designers now track and analyze the journey of employees through the office space to put data behind our layout, amenity, and space recommendations. To be truly successful, we must get to know our clients on a deep, personal level. We know that integrating brand authenticity, heritage and educational elements into the workplace can transform how employees interact with the space, but we can’t do that unless we really figure out what makes our clients tick. In retail, authenticity reigns. And nothing can replace knowing and experiencing a brand. If the space or the customer experience is dragging, your consumer will feel it. Good brand design is tailored to customer engagement at every moment and the design decisions reinforce the brand, answering questions such as: What is the unique offering, the unique culture, the unique ideal? Not surprisingly, this is becoming crucial to workplace design as well. Understanding our clients and these answers drive the design. We frequently refer to design decisions being those that reinforce the brand (offering, culture, ideals). It isn’t only about reflecting identity or personality, but also reinforcing what it’s all about – continually making loyalist more loyal and impressing visitors with the company’s dedication to its brand promise. A cohesive environment hinges on this intimate brand knowledge. We recently got to know a fashion-forward, military-inspired apparel company that has a very clear identity in their retail stores and online. But their workplace told a different story. At the business pitch, we could sense the disconnect of their space impacting their employees. We recommended an office design that builds from their brand story and applies it through the finishes, materials, visual surroundings and furniture. It has the potential to go from a lackluster, non-descript space to an ultra-urban experience that tells the story of the wartime comradery and ideals the company represents. The consistency between their physical and digital brand presence is essential as well as how they reassure clients and guests in the office space that they are secure in that very offering. Diverse and ever-more experiential programming is another retail element creeping into today’s top workplaces. Retail brands are learning to use their digital presence to reinforce their physical brand spaces and they must keep that offering fresh or risk pushing bored customers away – activities like coffee stands and flower shops within clothing stores or staffed workout classes within the floor space are becoming commonplace. The point is to always offer something new and different. This trend has accelerated and people are beginning to demand it not just in stores, but as part of their employment experience. We predict a major uptick in rotating or evolving experiences for employees as more advanced technology becomes integrated in workplace design. Understanding a brand’s heritage and history can tell us a lot about how their offices should be designed. These brand stories ultimately stem from a company’s values, which can and should impact the design – think of the plywood “door” desks at Amazon or Weyerhaeuser’s ode to timber throughout the new headquarters. Heritage and history were embedded in our design for travel giant FC USA, where our team was inspired by the glamour and impeccable customer service in the glory days of personal travel agents. We continued that theme by creating neighborhoods for different job roles, marked by the geographical regions of the world. Each neighborhood was differentiated with distinguishing textiles, finishes and color palettes. 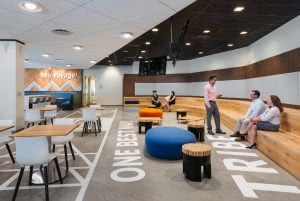 Underpinning the history of booking travel, as well as the FC USA heritage, made for an exciting daily journey for the employee, like embedding reminders into their daily routine by naming some common areas such as their café the Lido deck. In retail, educating the customer and teaching people how to utilize the space happens every step of the way. It even extends to the way employees talk – your Starbucks barista isn’t repeating your drink order for their own benefit, they are teaching you and others in line the correct way to order in the future. In our workplace design, we explore how core principles and workspace areas support the education of the brand. Our work with Fisher and Paykel, a premium appliance brand that expanded their headquarters from New Zealand to California, shows how important educational elements are to the workplace brand experience. Since their American employees were just as new to the history of the brand as American customers, we could align the two educational journeys. One of the ways we did this was by creating a dynamic timeline along the wall of the reception area. It went beyond a list of dates and milestones to include physical products like the first dishwasher they ever made. It’s not only visually appealing, but it helps everyone learn the company’s history and instills a sense of pride in the company. Our roots in retail design allow us to create offices that are much more than just places to do work; they are showcases for brand stories that educate clients and employees through shared experiences—a lot like your favorite retail store.